In continental Europe, this insect is a potentially important pest of cherry; a distinct race is associated with Lonicera. Larvae feed on the flesh of maturing fruits, and losses of cherries at harvest are sometimes of considerable significance. The pest does not occur in the British Isles, although the larvae are often found in imported cherries. Fig. 251 Wing of celery fly, Euleia heraclei (x!2). Adults occur from late May to early July and are particularly active in warm, sunny weather. Females deposit eggs singly in the developing fruits of cherry, the eggs hatching 1-2 weeks later. Larvae feed for about a month before vacating the fruit and dropping to the ground. Each then pupates in the soil and overwinters. There is just one generation annually. Adult 4-5 mm long; head and thorax black, marked with yellow; abdomen black; wings transparent, mottled with blue-black. 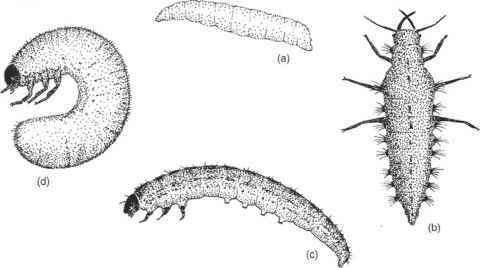 Larva up to 6 mm long, whitish; mouth-hooks not stongly curved and with a small projection behind the apical tooth (cf. Mediterranean fruit fly, Ceratitis capitata, p. 179).